A cocktail party favorite, bacon wrapped scallops are simple to prepare and easy to eat (especially while holding a drink). The meaty scallop wrapped in a strip of bacon is delicious on its own but is taken to another level when served with a lemon aioli for dipping. This recipe is perfect served by itself as an appetizer, or it can be made into a delicious accompaniment to any salad. Combine vinegar, oil, and black pepper in a medium bowl. Add scallops to the mixture and toss to coat. Cover and allow to sit for 5 to 10 minutes at room temperature. Preheat grill to medium-high heat. Cut bacon into thirds. 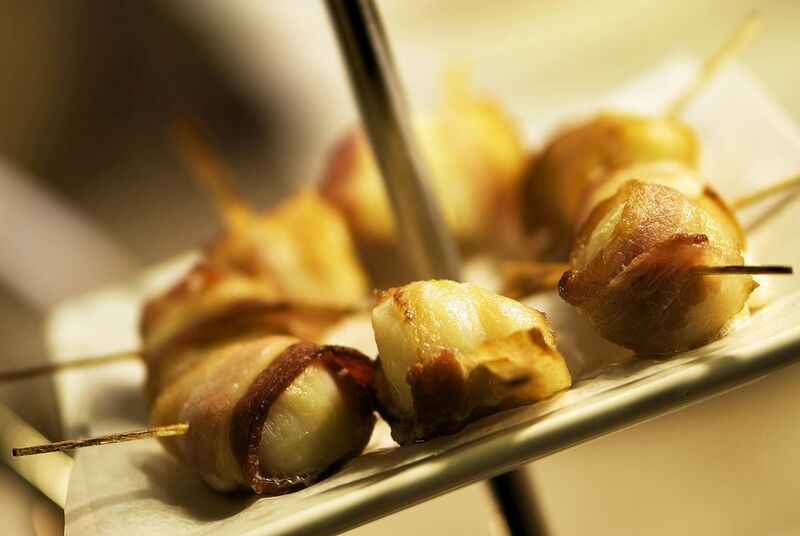 Wrap a piece of bacon around each scallop and thread onto skewers. There should be 3 to 4 scallops per skewer. Place skewers on a lightly oiled grill rack and cook for 3 to 4 minutes per side. When the scallop is opaque in color, remove from grill. To prepare lemon aioli, in a medium bowl, combine mayonnaise with lemon zest, lemon juice, garlic, mustard, salt, pepper, and parsley. Stir to combine and serve with bacon wrapped scallops. The recipe can be doubled if needed. If making ahead of time, cover the bowl with plastic wrap and place in the refrigerator. This recipe only works with large scallops, or sea scallops. Bay scallops are too small to prepare this way. Add extra flavor by using maple bacon or wrap the scallops in pancetta or prosciutto for a gourmet twist. Try substituting shrimp, if scallops are not available. The tails sticking out of the wraps make a nice presentation. Skip the aioli and serve the bacon wrapped scallops with a sprinkle of lemon or another favorite dipping sauce for a delicious appetizer. You can also place the scallops over fresh salad greens or lemon rice for a tasty main. You can also broil the scallops instead of grilling them, making it easier to cook a large batch.